Forex Magnates Directory (now rebranded Finance Magnates) is a free database of brokers, software developers, websites and other key players working in the Forex industry. Using a combination of cutting edge front and back-end technologies, we were able to feature easy-to-navigate information on all services at Finance Magnates so that the visitors using it could effortlessly locate important information on the site. As part of this project, OSD amalgamated previously fragmented broker information into a directory that is both scalable and flexible. The new directory can grow and change and allows members to easily receive information on upcoming events and training. 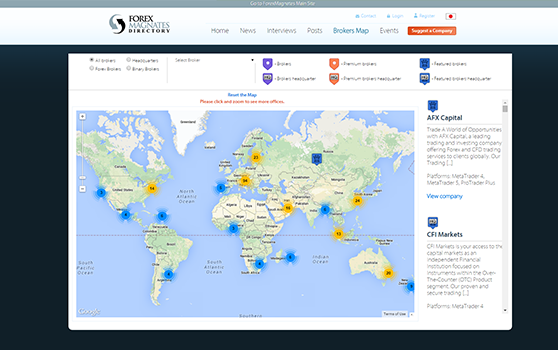 The site also features a global brokers map displaying all the broker offices registered on the site. Zooming in makes the pointers split, giving a more accurate positioning, while clicking a single pointer on the map brings up the broker's information in the left sidebar, with a link to the broker's profile within the site. View the project live here.